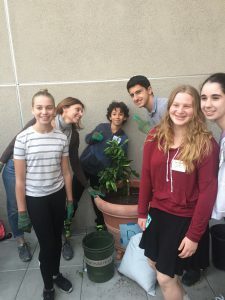 IKAR, a leading edge Jewish community based in Los Angeles, and Shalhevet, an Orthodox high school, worked together to bring the goals of Shalhevet’s Green Team to fruition in a project called Gan Shelanu. IKAR utilized their Green Action Minyan Tzedek members to help the Shalhevet Green Team educate themselves, other students, and their families in Judaic responses to environmental injustice, beginning by enacting changes in their own community. Their goals were realized through the following activities: installing recycling and composting bins and systems; purchasing and planting fruit trees; installing a drip irrigation system; leading educational workshops; purchasing compostable materials for daily use; and purchasing organic garden supplies. In their educational workshops, they offered a framework of Jewish textual and traditional connection to the earth and the mitzvah of protecting it. Finally, through their partnership with Netiya, they integrated “upcycle” activities into these community events, in which participants brought food scraps from their recent meals, learned to convert them into compost by physically turning and creating compost together onsite, and even taking home some of the compost to begin their own composting projects. The combination of text study and hands-on interaction with the gardening/composting process created a powerful experiential learning opportunity for all who attended.